the food, let's face it, was much less than desirable. (except on "roll-your-own-taco day" that day was good. real good. chicken nougat day wasn't so bad either. except for that day i swear it was more & more mystery muscle/fat and less & less chicken. that day was bad.) and pretty much the most popular item on the tray was the carton of chocolate milk. and there was a really really really mean lunch lady. who, in hindsight probably wasn't that mean at all. she just really really wanted us to finish everything on our tray. but she stuck to her ground, stood next to the garbage can (which was next to the exit, conveniently enough) and checked out the contents of our trays. if there was too much left on there we were banished back to the lunchroom to finish eating. all we ever wanted was to make it out that door! it was during those days that i got rather professional at hiding food under mashed potatoes and spreading it out so it would appear that more was eaten and stuffing it into my empty chocolate milk carton. and ever since then i have had a bit of a habit. if i ever have a carton (or a small plastic bottle roughly the size of a carton) i fold things up and put them in it. not sure if there really is a direct connection. but it seems reasonable enough. 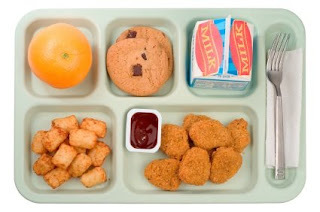 mmm... those tots look delicious. Are you going to eat those, or could I have them? Geri...I feel your childhood pain. We had a mean lunch lady in my school too. I remember in the first or second grade the lunch lady made me cry because she was so mean about me throwing away some of my food. In fact I think she made me go back and eat the rest. No wonder I'm such a Lard-A now...I was trained since childhood to eat EVERYTHING on my plate! Thanks a lot mean lunch lady, thanks a lot! So yes, Becky did tell me about the Ikea bowls and I scored myself some at my first visit there ever a few weeks ago. I thought this was going to be a post about your grandma when I saw the title. She was a nice Marge though. I didn't remember Marge til Bobbi reminded me of who she was. I don't think she was our lunch natzie when I was there BUT I do remember a few others! I won't mention any names incase someone reading this blog is related to them somehow. I also remember my teachers checking our milk cartons.... with a shake shake so shoving food in the carton was not an option for my grade... DANGIT! I had completely stripped my memory of Marge until this--geri, what have you done. Now I'll remember her everytime I dump food down the disposal. You make me laugh! PS I'm okay with purple cabbage now. That is so funny. I used to wait till she walked away from the garbage to clean a table off or something, and then I'd make a mad dash for the door. How Sad!! Glad those days are long gone! Why is it my lucky day? !